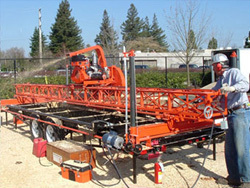 The Mobile Dimension Saw turns logs into lumber by traveling through the log rather than the log traveling through the saw. Once the log is in position the log doesn’t need to be moved or turned to be completely sawed. The log can be moved to obtain larger sizes or special shapes that cannot be obtained between the sawblades. Turning the log can make special projects of larger size such as tabletops, fireplace mantels, doors, diving boards and unique grain cuts. Three circular saw blades - one vertical, two horizontal - saw the width, depth and length dimensions simultaneously. 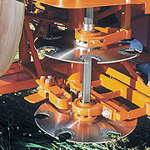 The three blades allow logs of any diameter to be completely sawed with minimum edgings and slabs. And accuracy is assured because each piece of lumber is completely sawed in a single pass. From the first cut to the final timber, each piece of lumber is precision-cut, then powered back to the operator for easy handling. No rehandling or resawing is required. And the operator remains in one position - at the head of the sawmill, controlling the complete operation and the size of lumber being cut. With the Mobile Dimension Saw, you get maximum production with minimum effort. The Mobile Dimension Saw will saw any size lumber up to 4-1/4'' (107.9 mm) by 12-1/4'' (311 mm) with the double edger saw and 8-1/4'' (210 mm) by 12-1/4'' (311 mm) with the single edger saw being used. Dimensional accuracy to plus or minus 1/32'' (.79 mm) is achieved because each length of lumber is completely sawed in a single pass. Two edger blades saw one or two lengths of lumber per pass. The top edger saw is positioned accurately to 1/32'' (.79 mm) quickly and easily by the edger control and dial with calibration ring. Adding a third edger blade lets you saw up to three pieces of lumber in a single pass. Additional edger blades (a minimum 2-inch (50 mm) spacing on the edger shaft) may be added for cutting multiple dimension lumber. For lumber larger than 4-1/4'' (107.9 mm) in width the bottom edger saw is changed to a 19-1/2'' (495 mm) saw blade to give you up to 8-1/4'' (311 mm) lumber. The top edger saw is moved up and out of the cutting operation. The horizontal dimension of the lumber, when using the board & block system, is determined by the horizontal movement of the sawmill. The movement of the sawmill is controlled by two gauges that make positive contact with the log. The horizontal dimension of the lumber using the end stand set up is by a rack and pinion gear controlled by a dial that registers the amount of the distance moved. 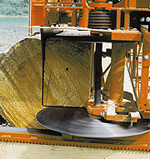 An offset control is used to adjust the sawmill to the log position and to the taper of the log.